If any of the above situations sounds familiar to you, you need SmartCells E. coli. SmartCells chemically competent E. coli are highly optimized to handle almost any ligation conditions. Real-life, Robust Performance. Most commercially available chemically competent E. Coli cells are tested using pure plasmids and under optimized transformation conditions. When they are transformed with real-life ligation mixtures you frequently get mediocre transformation efficiencies. In side-by-side comparisons with competitors' competent cells using real-life ligation mixtures, SmartCells consistently excel in providing the highest transformation efficiencies (Fig. 1). 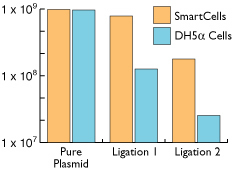 In addition, SmartCells are more tolerant to large volume of ligation mix (Fig. 2), which means you can add a greater or lesser amount of DNA into the transformation mix according to your needs. With transformation efficiencies using real-life ligation conditions of up to 1 x 109 cfu/mg, and unsurpassed plasmid yield, SmartCells� E. coli are ideal for both routine cloning needs and demanding high-throughput experiments. The SmartCells chemically competent E. coli is shipped frozen. For maximum stability and long-term use, store cells at �70�C upon receipt. The SOC medium should be stored at room temperature. Ultimate Convenience. 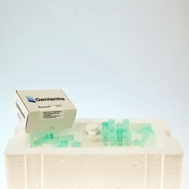 SmartCells™ competent E. coli are supplied in convenient, single-use 50 ml aliquots. Unlike cells supplied in bulky aliquots, SmartCells™ save you both time and money because there are no freeze-thaw cycles and less waste on unused cells. In addition, SmartCells™ are equipped with powerful genotypes to allow commonly used techniques such as blue/white screening. 20 pg/ul pUC19 self ligation transformed into 50 ul of SmartCells.